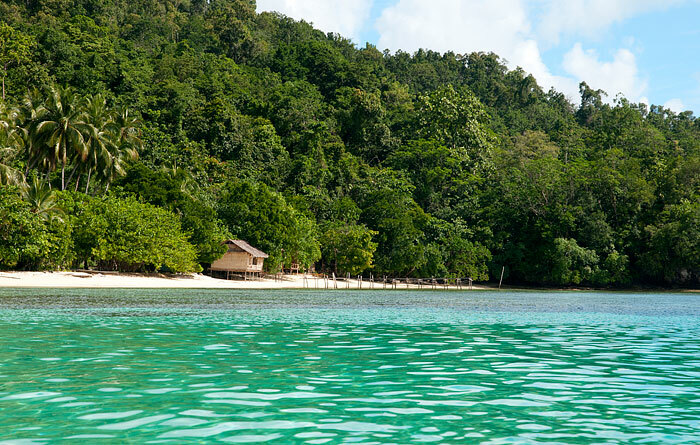 Private bungalows on a wide and sandy beach that’s calm and safe for children, good snorkeling and cuscus and Red Birds of Paradise in the jungle nearby. A room in a bungalow that has an ensuite bathroom and more than one bedroom Sleeps max. 2 persons / room. 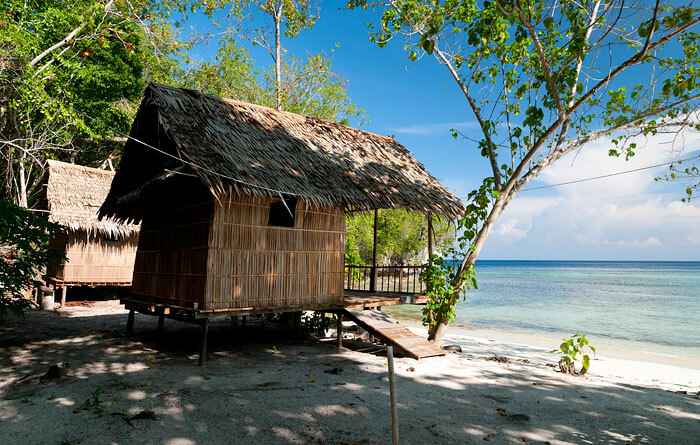 Yendebabo Homestay offers both traditional Papuan style bungalows and modern style 2 room VIP bungalows. 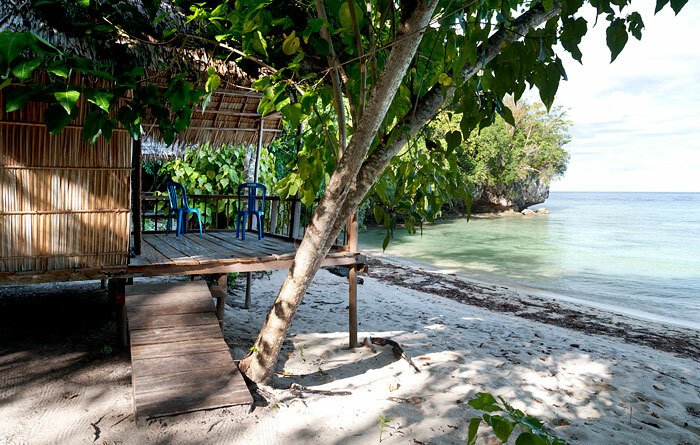 Yendebabo has three single room beachside private bungalows and one two room bungalow. All have verandahs and bedrooms equipped with mattresses with covers, pillows and mosquito nets. Some have plastic chairs and small tables. 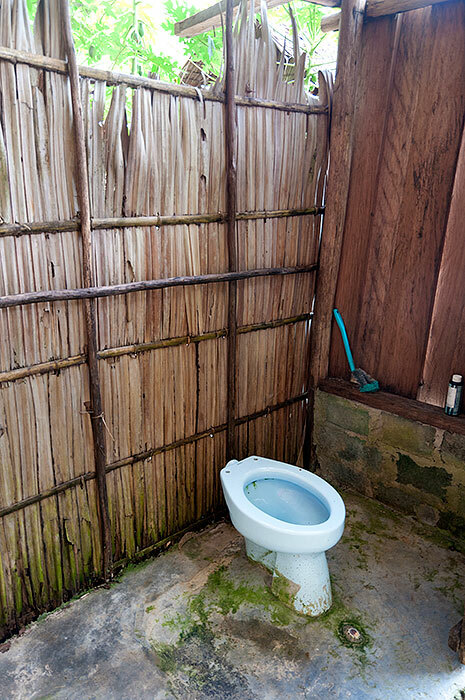 Guests staying in the traditional bungalows share a bathroom shelter which has a dip mandi bathroom and western style toilet in separate rooms. 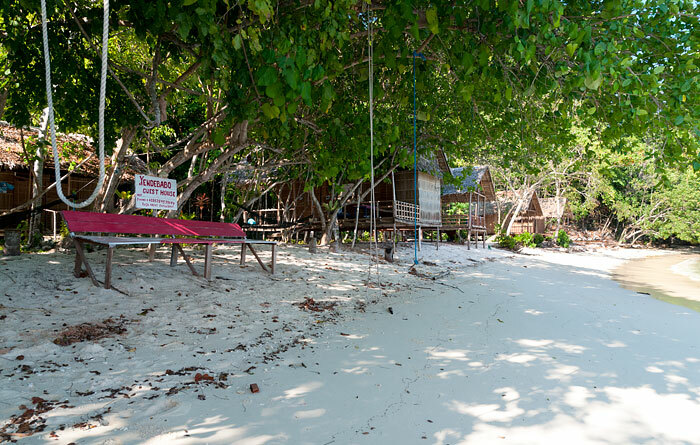 Also available are four 2 room beachside VIP bungalows. Each room has an ensuite bathroom with shower and western style toilet. The VIP bungalows have glazed windows, lockable doors and double beds. 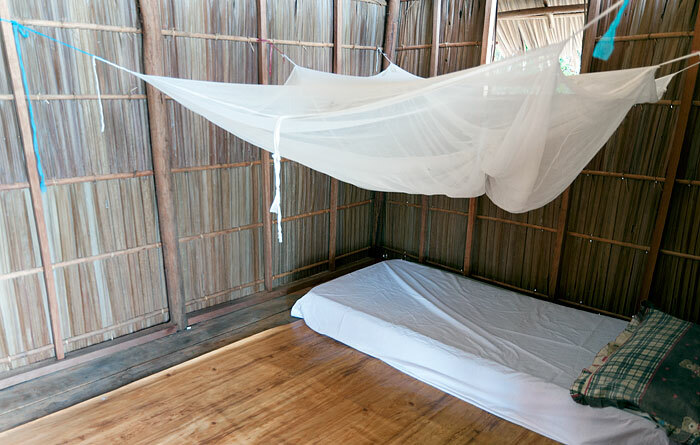 There were no mosquito nets visible on the day we visited and we noticed that the rooms were quite a bit hotter than the traditional bungalows due to their solid timber and concrete construction. 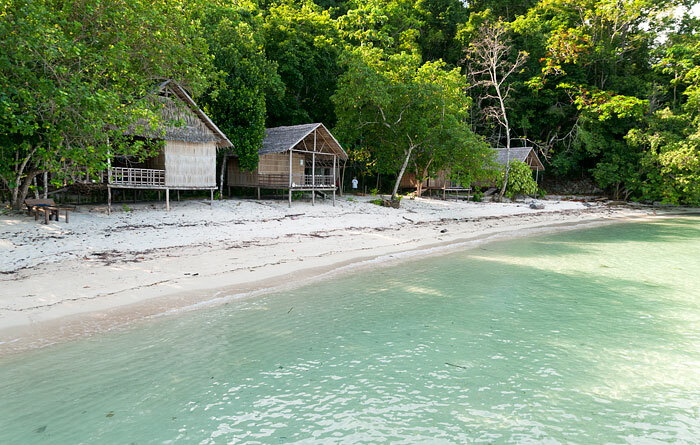 The bright blue metal roofs of the VIP bungalows ensure you’ll always know where your accommodation is: Unlike traditional Papuan buildings, these are visible from miles away! 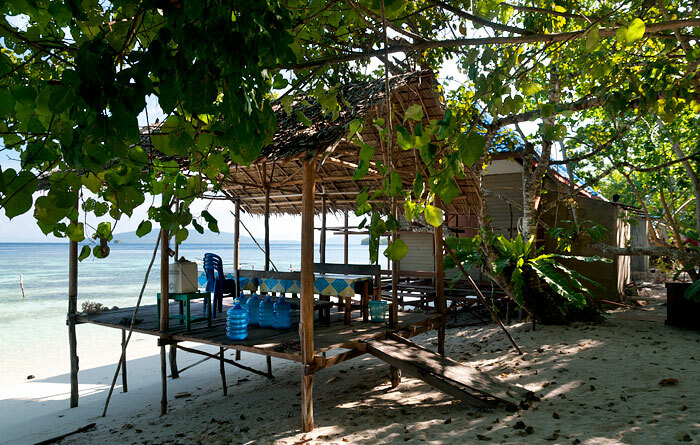 Meals are served for all guests at Yendebabo’s beachside dining shelter. Drinking water, tea and coffee are always available there. In addition to the long table and bench seating found at most homestays, Yendebabo Homestay also has a refrigerator for cold drinks! 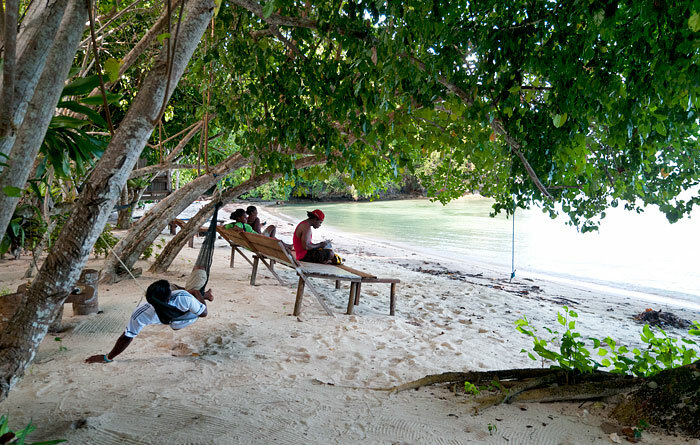 In addition to the dining shelter and bungalow verandahs, Yendebabo has shady beachside seating and a hammock for relaxation. Yendebabo has good cell phone reception and lighting and electricity is supplied at night by a generator. Basic supplies are available at Friwen village, which is about ten minutes away by boat. English is spoken at Yendebabo and the owners live on site. 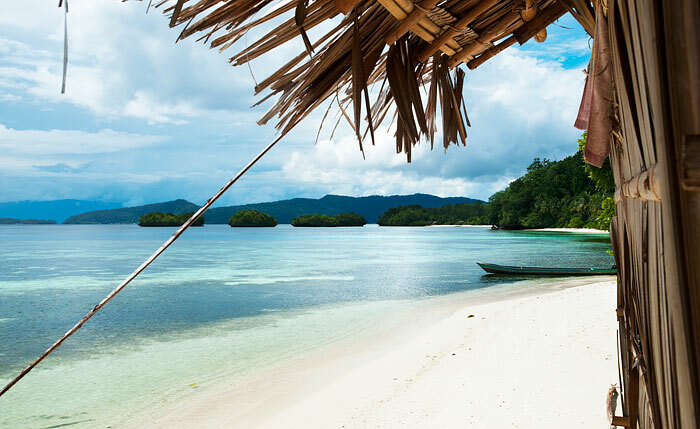 Waisai – Yendebabo transfers are by speedboat and cost IDR 500,000 each way (IDR 1,000,000 for the round trip). The transfer price is shared by passengers and the boat can carry up to 8 people. Yendebabo and its neighbour Meot Trairam Homestay share a marvellous stretch of sandy beach which is sheltered and perfect for children. The sand gives way to seagrass and then to reef as you move away from the shore and there’s a wide variety of marine life to be observed. 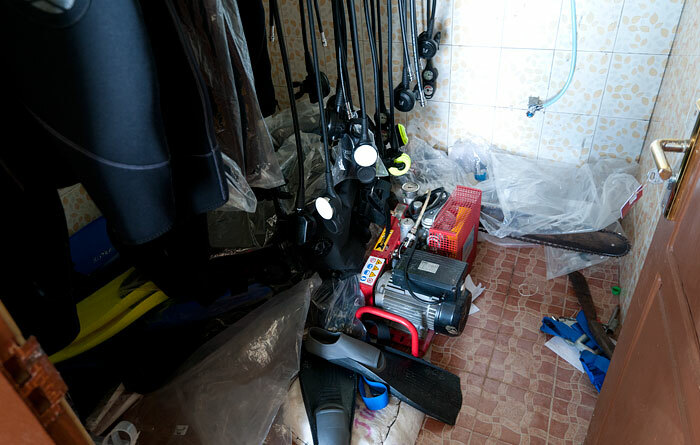 Snorkellers can rent fins, masks and snorkels when not in use by divers, but bringing your own equipment is always a good idea to ensure you don’t have to deal with ill-fitting masks or fins. Yendebabo has a speedboat capable of carrying 8 passengers and sightseeing trips can be arranged on request if the boat is not otherwise busy. Dawn excursions (departing 5.00am) to see Red Birds of Paradise display are available at Yendebabo and cost IDR 100,000 per person. 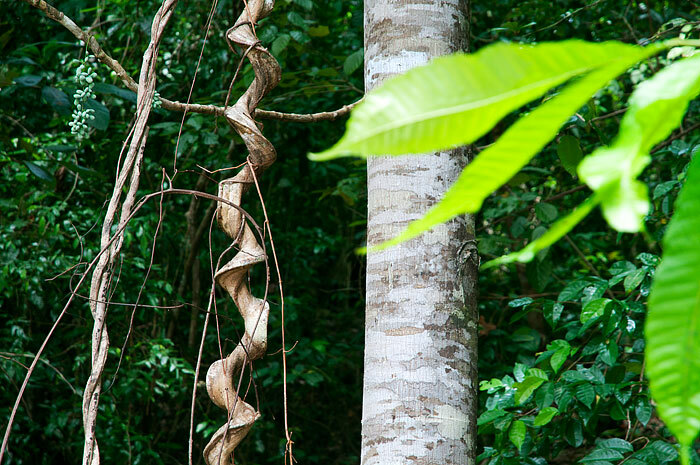 Many other interesting animals inhabit the jungle at Yendebabo – be sure to keep your eye out at night for cuscus! 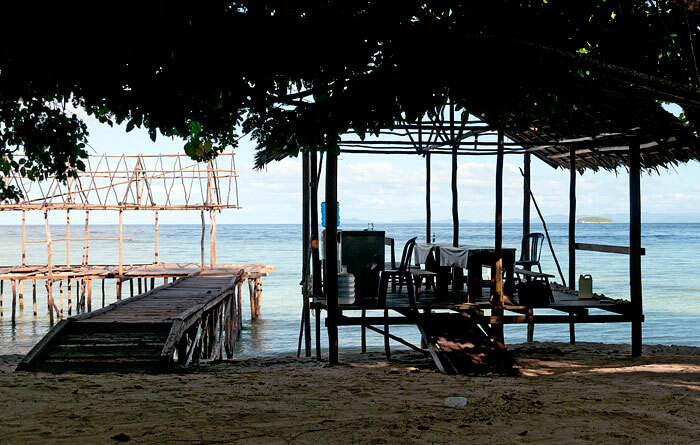 I stayed in the VIP bungalow for 5 nights and went diving with the next door Corepen homestay. Yendebabo itself has no dive shop (anymore). The bungalows are pretty run down now and only some have mosquito nets. I had the impression that the owner doesn‘t put much effort anymore into the place. Food was quite basic in comparison with other homestays (note: I don‘t eat seafood). Hammocks and a small table would be nice. No rats were seen. I asked the owner for some trips or program but unfortunately he didn‘t have anything to offer. Snorkeling in the bay is really good, so is the beach. (Baby) sharks show up near the jetty at dusk. Matias also showed me a Cuscus in a tree behind the homestay. diving preps and brief limited feel cautiosly unsafe. I had plan to do 10 dives but decide three dives enough. Food is okay, very little not very good at least its properly cooked. Bathroom are dirty. Its a shame. They clearly invested a lot of money to built but no skills to run this place. Stayed there for twelve nights in December 2015. Good bungalows, good hammocks too. I liked the place, especially the jungle setting with the sounds of birds after dawn and in the late afternoons, of insects at night. I liked Mathias, the owner, with whom I went out snorkelling several times. (boat charter) House reef, nice at places close to the drop off. Big advantage, a sandy lagoon near by, from which you can enter the water even at low tide. (A problem at quite a few places without a jetty.) Food got decent after a poor start. A quiet place, what I liked: Incoming guests mostly kajakers staying for one or max. two nights. The Mandi/kamar kecil could be a little bit cleaner. Pollution of the beaches by garbage coming in with high tides was a general problem in the whole area at the time. Poor visibility due to plancton blossoming/jellyfish plaque another. 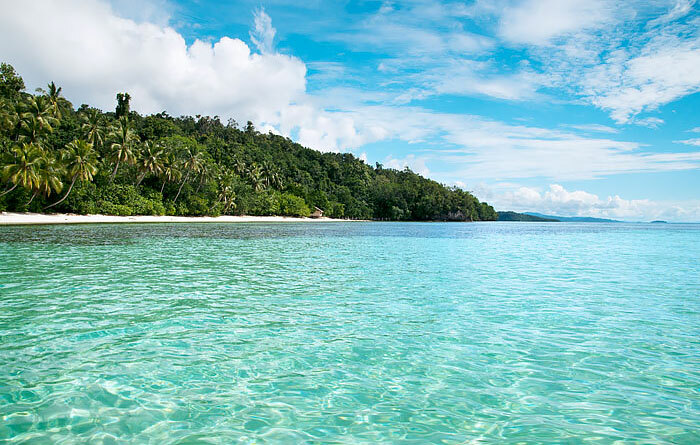 Apart from that, Raja Ampat according to my opinion the true underwater capital of the world at this time. Nice place. 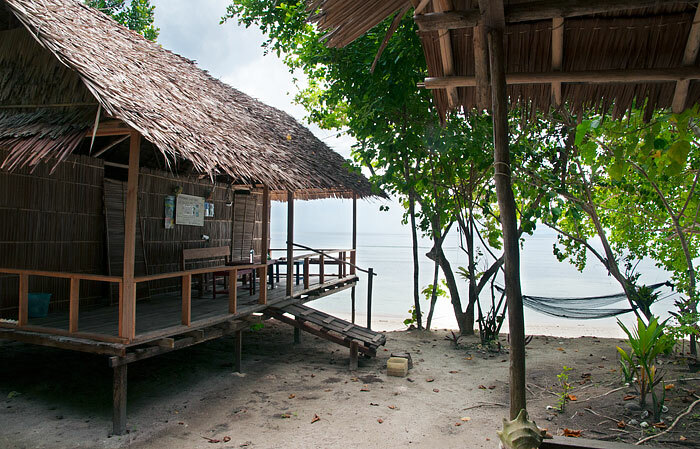 Stayed in the VIP bungalow, which are really new and maybe the best “homestay” accomodation you can get in Raja Ampat. Also not too hot at night as one might think. Their blue roof is quite an eyesore though. Out of the 11 rooms, only 2-3 were taken beginning of Dec 2015, so it was very quiet. 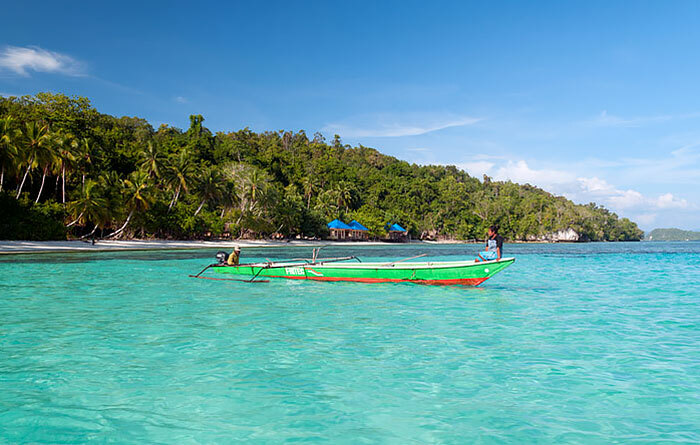 Nice beach and decent snorkelling from the shore though not special by Raja Ampat standard. Do a trip to Misokon / Cape Kri / Yenbuba jetty for that. You can ask Mathias, the owner, to take you up the hill for a great sunset view overlooking a lagoon (20 minute walking uphill). He wants to build a bungalow there, I think would be quite special for a secluded spot. Internet via mobile connection works well. Food was decent. If beer is important to you, at low tide you can walk to Kordiris homestay (on flipflops because of rocks) and buy it there. The owner, Mr Mathias and his family was soooooo awesome!!! They are friendly, helping, and most importantly great cooks!! The place was comfortable. I chose to stay at the modern room with the bathroom inside of my room, so I didn’t have to use the shared bathrooms. The beauty of Raja Ampat underwater was just a swim away in front of my room. It was a nice warm up before the actual diving. I stayed for 3 nights there and apparently it wasn’t enough. 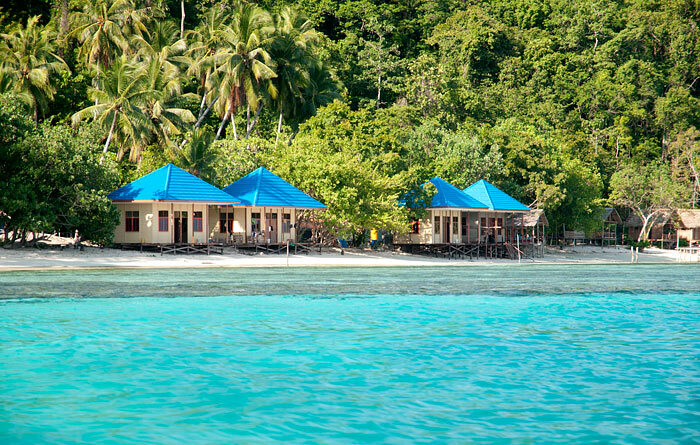 Well no one will ever get enough of Raja Ampat! The beautiful film “Journey to the South Pacific” was the inspiration for our visit to Raja. At first we had planned to stay in a resort, but after discovering this amazing website, we decided to try the homestays, and we’re thrilled we did. This site did a really good job of presenting a realistic picture of what to expect from the homestay experience. We were in Raja for 9 days and we stayed at three homestays. They were very different and equally wonderful in their own way. At all three homestays, we were the only guests. Freddy, the owner was waiting for us as we disembarked from the Sorong Ferry and whisked us right to Mansuar. This homestay is in a great location because it is so central, yet feels remote. Pros- the homestay bungalow was huge, with a wonderful terrace from which to view the sunrise peeking over nearby Kri. Bathroom (separate toilet and shower!) was in a lovely grove of coconut palms and was very clean, and private. Over water location kept us relatively cool. Freddy runs the generator well past midnight, so charging your devices is not an issue. Meals were served on our own terrace, and the food, while very basic, was varied enough and there was plenty. Reef, reef, reef- snorkeling was excellent right off the homestay. 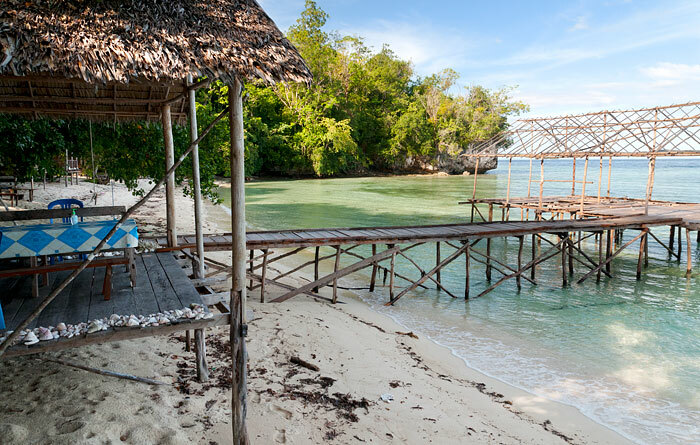 It’s just a short, beautiful walk to nearby Yenbuba village where snorkeling was also amazing off the pier. Freddy was very social. Cons- Freddy could use a touch of maintenance on his place. We found some torn roofing so if it rained, you might get some wet belongings. Also three of the four chairs were broken, so we used the broken chairs as side tables for our electronics and toiletries (there was a large dining table on the verandah, however). 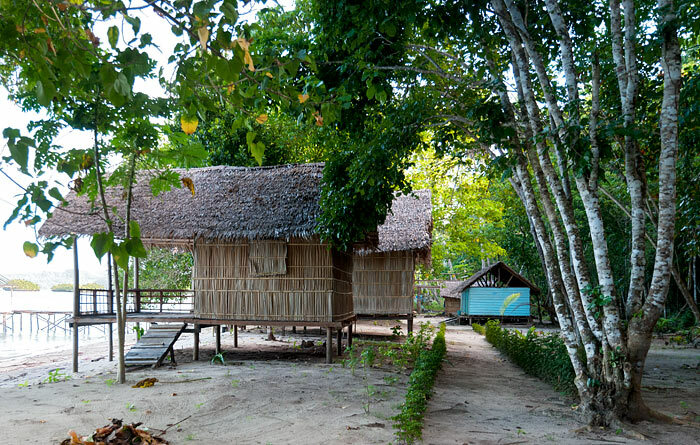 Yendababo Homestay is on one end of a breathtaking sweep of beach. Mathias, the owner lives on site with his family. 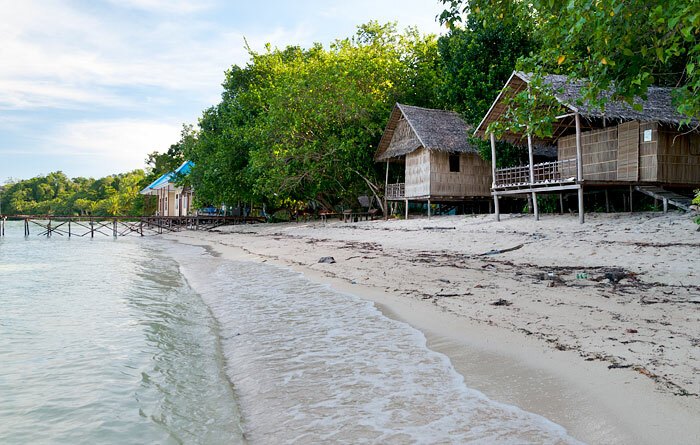 When we approached the Homestay by boat, we were a bit nonplussed to see four large modern bungalows with bright blue plastic roofs next to several traditional Papuan style huts. We were offered a choice to stay in the newer bungalows (private ensuite baths in each) but opted for the traditional hut. Mathias lives onsite with his family. 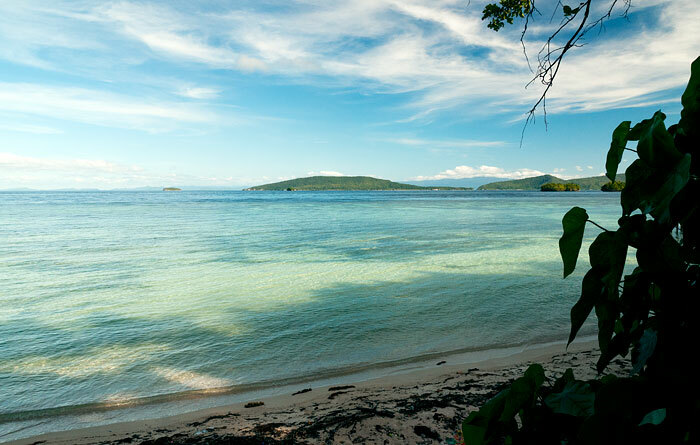 Pros- the beach location with soft, white sand, palm trees, and emerald water is unsurpassed. The house reef had the most amazing variety of coral we saw anywhere. It was spectacular and we snorkeled several times a day during out stay. Our bungalow was not huge, but it was very well maintained, comfy mattress, and just steps away from the water. There was a very large table on our covered verandah for storing toiletries, electronics and whatnot. Mathias and family were ultra-accommodating…when he saw the one plug was not quite enough for our rechargeable camera batteries and phone, he instantly installed a power strip. Meals, served in the dining pavilion, were fantastic- wonderful fish, fried rice and eggs for breakfast, fresh vegetables, and plenty to eat. Excursion to Kubui Bay and The Passage would have been wonderful on its own, but Mathias also took us to Hidden Bay, a jaw-dropping inlet with turquoise and emerald green water, dotted with small islands. He also took us to several special snorkeling spots away from the homestay. Cons – although the bath hut contained a western-style toilet and western-style hand shower, both were in the same room- would’ve preferred separate spaces. 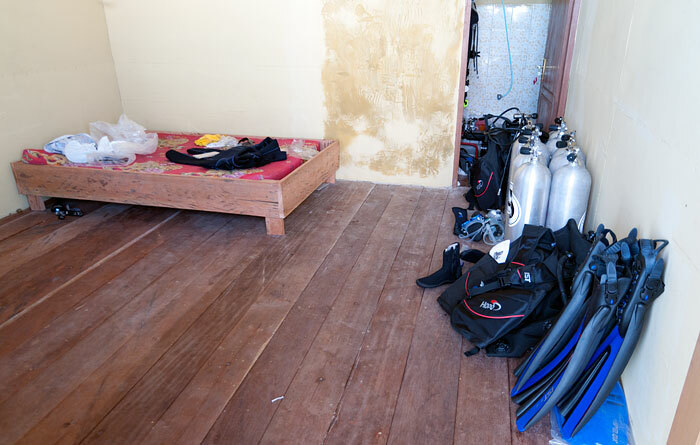 Mathias is in the process of modernizing his homestay into a dive-oriented enterprise which he hopes to debut this summer. Although we realized the dive business is more lucrative, we fear the traditional spirit of Yendababo may be lost. 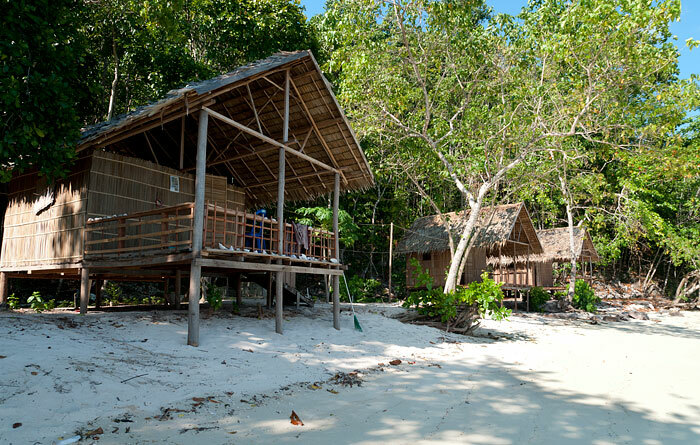 This homestay felt very different from the others in that it is on the main island, and not so remote. Yet, Warimpurem was full of wonderful surprises that made it very special. The owner (did not remember his name) and his wife, the legendary Mama Engge, live on site with various relatives. Pros-the family at Warimpurem was probably the most friendly and inviting of all we came in contact with. And Mama Engge’s reputation as a fantastic cook is not overstated. The food we had here was incredible. One of our favorite memories, was daily tea around 430/5p when we were served fried plantains, which were the best we had ever tasted. 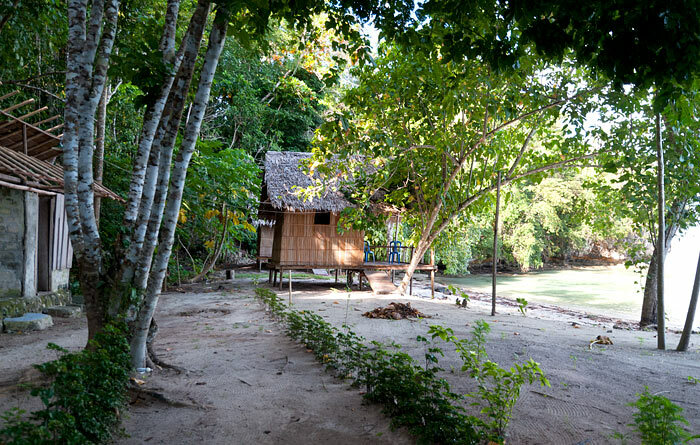 The homestay property features a wonderful natural spring, which is exposed at low tide. The water is refreshing, and it is lovely to sit in it and watch the kids at play. We even joined some local women and did a bit of laundry there. There is something called the Firefly Tree, and it is magical. At night, thousands of fireflies light up a tree by the entrance to the homestay, and flash their lights on and off as if on the same circuit. It was breathtaking. Also, this homestay is close to more birdlife than most others, including the famed Bird of Paradise, although when we saw him, he did not display . Cons- Snorkeling was just ok here. Because our bungalow was away from the beach, and a bit more in the jungle, this was the only place where we experienced some mosquitoes, but there weren’t very many. 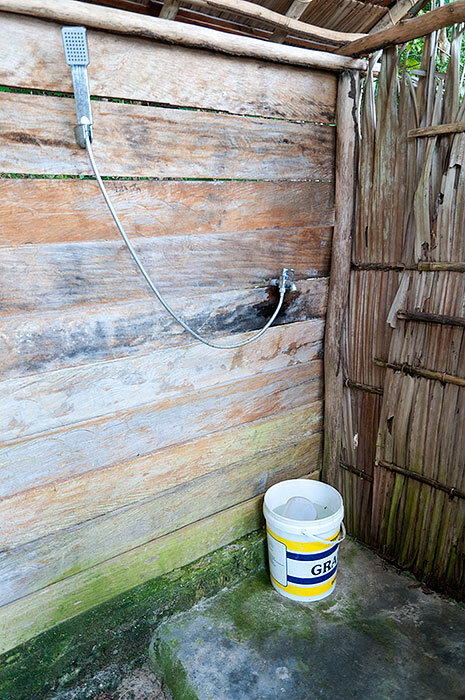 The squat toilet (which actually wasn’t so bad) and the dip shower were in the same space when a separation would have been better. However, we spotted three nearly completed brand new buildings with western-style toilet and separate showers nearby so this won’t be an issue moving forward. We stayed with Mathias and his family in July 2014 and had a wonderful time. 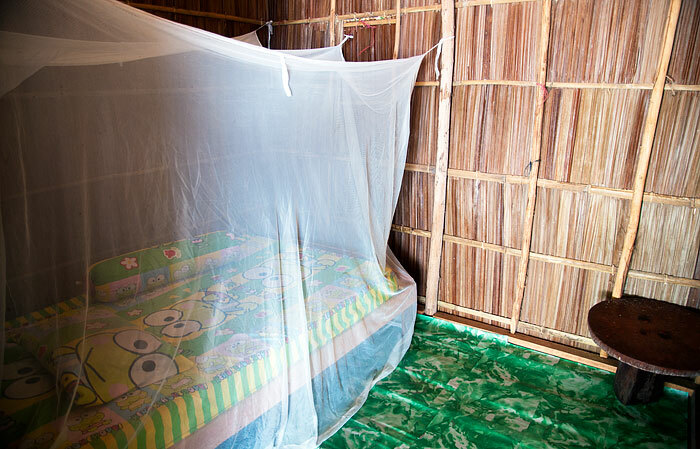 The bungalows are simple but comfortable, with clean mattresses and mosquito nets. We also had a lovely porch with a view on the ocean which was steps away. They have a western style toilet and water to shower with. We had three delicious and large meals per day- rice, fish, veggies, eggs. Mathias’ wife always made sure everything was perfect and we never went hungry, especially after hours of snorkeling. The location is very good and not too far from Waisai (around 45 minutes). 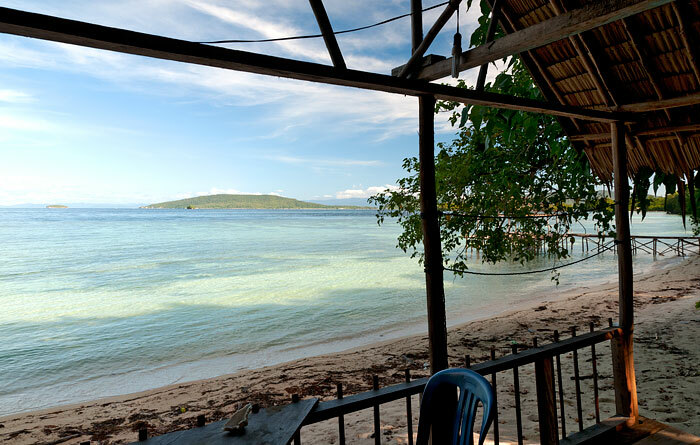 There is beautiful reef right in front of the bungalowsn with abundant marine life. Not much else to do around other than snorkel and relax all day, which was exactly what we wanted. We also booked a few excursions with Mathias and he took us to see Mantas and mangroves. He was always accommodating and showed us a few great snorkeling spots as well. On our last day we were surprised by finding baby turtles beside our bungalow, already out of their shells and ready to start their journey. It was the perfect end to our unforgettable trip and I wouldn’t hesitate to return. any chance of getting in touch via email? i’m currently not able to make international calls! Hi Laura – You can try booking at Yendebabo via Ranny. See her guide page. Prices for accommodation and transport should be the same as shown on this page. Your custom Google Map is getting better and more useful all the time! Can you add roads or paths and village locations? That would help us understand how to get around as well as where to stay. I’ll send you my .GPX files when I get back!